How long does a car accident injury claim take? Kahler Personal Injury Lawyers > Car Accident Injury > How Long Will My Car Accident Injury Claim Take? When will I receive compensation? If you or a loved one has been injured in an automobile accident, you will have many questions to ask before choosing a personal injury lawyer. When will I receive compensation? Is very likely to be one of them. In Ontario, it can take many months or years to recover compensation for all of your losses. Every car accident and personal injury claim is different. As a general estimation – most personal injury claims take between 1.5 and 2.5 years to reach and adequate settlement or verdict in court. 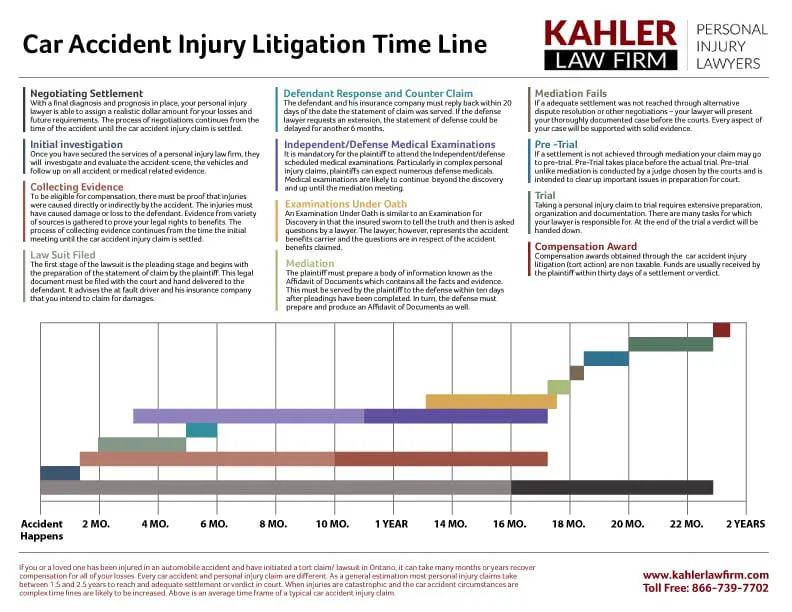 When injuries are catastrophic or the car accident circumstances are complex, timelines are likely to be increased. The following is an overview and timeline of the steps involved when litigating a car accident injury claim. When there is a car accident, there are two different claims available to injured persons or their loved ones. These are distinct claims: a lawsuit and a claim for no-fault benefits (known as accident benefits). If the injured person is not at fault for the collision, they can commence a lawsuit against the driver who was at fault for the collision. To file a successful car accident injury lawsuit, it must be proven that another person did something that they ought not to have done (for example, texting while driving) or did not do something they ought to have done (for example, not stopping at a red light) and that these irresponsible actions caused the victim to have serious and permanent injuries. The owner of the vehicle driven by the at-fault driver is also considered responsible for the collision in most cases. Regardless of whether the injured person is at fault for the collision, they are entitled to accident benefits through their own insurance company (known as the accident benefits carrier). If the person was a pedestrian or a passenger and did not have insurance, there are alternative insurance companies that may be looked to for benefits. The benefits available may be include a weekly disability benefit, such as an income replacement benefit, a caregiver benefit, or a non-earner benefit; medical and rehabilitation benefits for treatment; attendant care benefits; and housekeeping benefits. Eligibility for each of these benefits depends on the nature and extent of the injuries and on the activities of the injured person before the collision. To file a successful accident benefits claim, it must be proven that a person involved in a car accident (regardless of fault) suffered injuries as a result of that accident and cannot work or care for their children or carry on substantially all of their normal activities, needs medical treatment, and/or needs help taking care of themselves or their house. If the collision caused death, the loved ones of the deceased may be eligible for funeral and death benefits. If a loved one needs counselling or cannot work as a result of emotional impact of the injured person’s collision or the loss of the loved one, they can apply for their own benefits through their own insurance company. The initial meeting with a personal injury lawyer gives injury victims an opportunity to describe the details surrounding the accident. Your lawyer will require information on police and medical reports, eye witnesses, photos and insurance companies involved. He will ask about injuries, medical treatments after the accident, tests, diagnosis, prognosis and continuing medical follow-ups. There will be questions regarding pre-accident employment and health. This initial meeting will help the lawyer determine whether the client is eligible for accident benefits and if a lawsuit against the at fault driver is an appropriate course of action. To file a successful car accident injury claim, it must be proven that another person failed to carry out a duty of care and that these irresponsible actions, directly or indirectly, harmed the injured person. The purpose of this first meeting is for the lawyer to determine whether or not you have a case, and if so, agree to represent you. At this point, release forms are signed, giving the lawyer permission to act on your behalf with: medical, police, insurance and all personnel relevant to the case. If the accident details and injuries are straight forward, and there is clear fault determined, the initial consultation could take as little as 45 minutes. When the injuries are uncertain; the personal injury lawyer is put on retainer and the accident benefit file is commenced, while the injuries are monitored for a possible lawsuit. If the case is complex or there is a dispute over liability – the meeting could take place over several hours. In many car accident cases, insurance companies discourage clients from getting legal counsel and attempt to negotiate a settlement with you rather than through your lawyer. This is done in the hope of avoiding paying what a claim is truly worth. Insurance companies urge clients to settle on a full and final basis, usually before they have fully recovered from their injuries or know whether they will ever recover. In the midst of stress and uncertainty it is a tempting offer that comes with a hidden price tag. It is crucial to wait until injuries are healed as much as possible or the extent to which they will heal is known and you are is as close your pre-accident condition you will ever be. With a final diagnosis (what is wrong) and prognosis (how will the personal heal) in place, your personal injury lawyer is able to assign a realistic dollar amount for your losses and future requirements. The process of negotiations continues from the time of the accident until the claim is settled. Once you have secured the services of a personal injury law firm, they will investigate and evaluate the accident or medical related evidence. This may include attending the accident scene, evaluating the vehicles, hiring experts who can reconstruct what happened, and/or speaking to eye witnesses. During the lawsuit process, the injured person who seeks compensation is referred to as the plaintiff. The person who is being sued for negligence causing harm is referred to as the defendant. During the accident benefits claim process, the injured person who seeks benefits is referred to as the insured. The insurance company is referred to as the accident benefits carrier. To be eligible for compensation through a lawsuit or for accident benefits, there must be proof that injuries were caused by the accident. The injuries must have caused damage or loss to the plaintiff/insured. Evidence from variety of sources is gathered to prove your legal rights to accident benefits and to damages in a lawsuit. All medical evidence is collected from the first emergency hospital visit and every time following until the case is won. This includes x-rays, tests, surgeries, doctors’ visits, therapies, interventions, medications and alternative therapies. All police reports, eye witness testimonies, photos, and social media conversations may be included. Professional witnesses and accident re-construction specialists are consulted. The things that helped and did not help you get better, all become part of the file that will support your case in court. Insurance companies often try to minimize or deny the damages. They may claim that your injuries were not a result of the accident citing a previous history of medical intervention for the same type of condition or body part. Evidence is continually collected and evaluated by both sides, until your case is settled. The first stage in applying for accident benefits is to notify your own insurance company of the collision. This should be done within 7 days of the collision and is a very brief conversation that provides the basic background information to the insurance company. The insurance company then sends out an application package. This typically includes a number of different forms that can be very confusing. Possible forms include the Application for Accident Benefits, which provides background information on how the collision occurred and what your injuries and status are; an Employer’s Statement, which tells the insurance company about your job before the car accident; a Disability Certificate, which is filled out by a treatment provider and describes the injuries and difficulties you have; a Permission to Disclose Health Information, which allows the insurance company to get your medical records; and an Expense Form, which lets you or your family claim for out-of-pocket costs such as an ambulance bill or parking at the hospital to visit you. If you had more than one job before the collision, it will include an Employer’s Statement for each employer. Finally and only when applicable, the application package will include a Form to Claim Death Benefits and Funeral Benefits. These forms form the foundation of your or your loved one’s claim for accident benefits. Filling them out incorrectly can therefore hurt your claim. Your lawyer should assist you with filling them out. The first stage of the lawsuit is the pleading stage and begins with the preparation of the statement of claim by the plaintiff’s lawyer. The Statement of Claim draws from the evidence that has been collected and marks the formal beginning of the lawsuit. This legal document must be filed with the court and hand delivered to the defendant. It advises the at-fault driver, the owner of the vehicle of the at fault driver, and their insurance company that you intend to claim for damages. It outlines the details of the accident and the at-fault drivers negligence in causing it. The document lists your injuries, pain and disability suffered, along with necessary remedies. Future needs could include ongoing attendant care, assistive devices, medication, counseling and multiple surgeries. The plaintiff must provide evidence to verify all statements regarding fault, the extent of injury and loss and rights to the amount of benefits requested. The defendant and his insurance company must reply back within 20 days of the date the statement of claim was served. If the defense lawyer requests an extension, the statement of defense could be delayed for another 6 months. The defense response document is called the Statement of Defense. The defendant will typically deny all claims found in the Statement of Claim, including alleging that he was not responsible for the accident, that there was shared liability, that the plaintiff is not injured or not seriously injured, or that the plaintiff could work. This forces the plaintiff to prove everything they have alleged in the Statement Of Claim. There are three types of independent medical examinations: those scheduled by the lawyer for the plaintiff/insured, those scheduled by the accident benefits carrier, and those scheduled by the lawyer for the defendant. Your lawyer may need medical reports from an expert or several medical experts to prove the extent of your injuries and disability. The experts will be asked to give a diagnosis and prognosis, comment on the cause of the injuries, and comment on the impact on your ability to work, care for yourself or loved ones, clean your house, and enjoy your usual activities. It is typically mandatory for the insured to attend insurance scheduled medical examinations. The insurance company needs these assessments to determine whether you are eligible for the benefits you seek. For example, if you are seeking income replacement benefits, the insurance company will want an expert to confirm whether or not you can work. These examinations may take place in the city in which you reside or a relatively close proximity. If the insurer schedules the assessments a far distance outside your area, the insurer is required to pay for your travel expenses to the assessments. It is typically mandatory for the plaintiff to attend the independent/defense scheduled medical examination(s). These experts will be asked to comment on the same types of things as the experts hired by the lawyer for the plaintiff. These examinations may take place in the city in which you reside or a relatively close proximity. If the defense schedules examinations a far distance outside your area, your lawyer may reject the defense request or have the defense pay for transportation and or hotel accommodation as appropriate. Independent medical exams are conducted by medical practitioners chosen by the lawyer for the plaintiff, the insurance company, or the lawyer for the defendant. Don’t let the term “independent” fool you. They may not be. These specialists may be hand picked by the insurance company or defense based on their previous bias towards an insurance or defense opinion in similar cases. The doctors for the insurance company or the defendant are not there to help you get better, offer you advice, or refer you for treatment. The role of the insurance or defense medical expert is to scrutinize your level of injury, gather information to defend against your claim or deny you benefits, provide information for cross examination, and to assess for exaggeration or malingering. The outcome of these insurance or defense medical examinations are often times supportive of the accident benefits carrier or the defendant. Do not let this discourage you. Your lawyer will likely explain this reality and tell you what you should do and what you can expect. The accident benefits carrier will inform you of the details of the insurance assessments. Your lawyer will likely inform you of the nature of each requested defense examination, including the time, location and the practitioner doing the assessment. If you are unsure or have questions on what to do in the assessment – always ask your lawyer before attending. You should always be consistent and honest with your answers. The accident benefits carrier is often looking for changes in your story, inconsistencies and opportunities to challenge your credibility. Never sign anything in an insurance or defense medical examination without speaking to your lawyer first. It is not uncommon for medical examiners to perform a lack luster examination and then ask you to sign a form saying that the examination was thorough. Do not feel pressured into signing anything. Tell the examiner that you must talk with your lawyer before anything can be signed. Particularly in complex personal injury claims, plaintiffs can expect numerous insurance and defense medicals ranging from occupational therapists, neurologists, psychiatrists, pain specialists, forensic accountants and many possible others. These assessments can be exhausting and extremely overwhelming. Be sure to communicate with your lawyer regarding the frequency and duration of these appointments. Depending on the injuries you have suffered full day assessments may not be physically possible. Continued communication with your lawyer is important while these exams are taking place. The next stage is the Discovery Stage of the personal injury case which begins with the serving of the Affidavit of documents. The plaintiff’s lawyer must prepare a documents brief known as the Affidavit of Documents which contains all the documents relevant to the plaintiff’s case – with exception to any documents that are privileged. This must be served by the plaintiff to the defense within ten days after pleadings have been completed. In turn, the lawyer for the defendant(s) must prepare an Affidavit of Documents containing all the facts and evidence pertinent to the case for the defense. This document is served to the plaintiff. The second part of this stage is called Examinations for Discovery (See article on what to expect) , which continues to build on the information provided in the pleadings and early discovery. The parties are sworn to the tell the truth and then questioned by the opposing lawyer about matters relevant to the case (for example, how the collision occurred). Everything which has been said in the Examination for Discovery is written down by the court reporter and may be admissible in court. The complete Discovery stage can take from one to one and a half years. An Examination Under Oath is similar to an Examination for Discovery in that the insured is sworn to tell the truth and then is asked questions by a lawyer. The lawyer, however, represents the accident benefits carrier and the questions are in respect of the accident benefits claimed. Subsequent to the Discovery stage is Mediation, which is an informal meeting between the two sides. This procedure is presided over by a non-biased third party person, whose sole job is to help the parties find resolution. After they have gone through the processes of pleadings and discovery, each will have a deeper understanding of the other’s position. The mediation process gives opposing parties the opportunity to negotiate their own settlement by coming up with solutions that are agreeable to both. Mediation can take a day or less. Many claims are successfully settled during this stage. The parties can choose to repeat mediation if they are agreeable to continuing, if not, the dispute will progress to arbitration or Pre-Trial. If a accident benefits insurance company denies you a benefit (for example, if the accident benefits insurance company says that you no longer need physiotherapy) and you or your lawyer disagrees with that denial, the lawyer will file an Application for Mediation with the Financial Services Commission of Ontario. A Mediation then occurs, similar to the Mediation held in the lawsuit. The parties may reach a settlement that addresses only the benefit(s) denied or they may reach a full settlement of the entire accident benefits claim. A full settlement of the entire accident benefits claim means the accident benefits carrier gives you a lump sum amount of money in exchange for you giving up your right to claim further accident benefits from the collision. If the Mediation is not successful, the lawyer has the option of filing a Statement of Claim or an Application for Arbitration. If the lawyer files a Statement of Claim, the claim for denied benefits then follows all of the steps described for a lawsuit. If the lawyer files an Application for Arbitration, the claim for denied benefits proceeds to a Pre-Hearing. If a settlement of the lawsuit is not achieved through mediation your claim may go to Pre-Trial. Pre-Trial takes place before the actual trial. Pre-Trial is conducted by a master or a judge chosen by the courts and is intended to clear up important issues in preparation for court. Details regarding witnesses, translators, juries, will be examined and each party’s readiness for court will be assessed. The goal is that when the lawsuit goes to court, precedings run smoothly and overcrowded court resources and time are not wasted. The Pre-Trail judge will likely take one last opportunity to mediate in efforts to bring about a mutually agreeable settlement. If a settlement of the denied accident benefits is not achieved through mediation, the claim then goes to a Pre-Hearing. Pre-Hearing takes place before the Arbitration. Pre-trial is conducted by an arbitrator and is intended to clear up important issues in preparation for the Arbitration. The Pre-Hearing arbitrator will also likely take one last opportunity to mediate in efforts to bring about a mutually agreeable settlement. If a settlement of the denied accident benefits is not achieved at the Pre-Hearing, the arbitrator will schedule a Settlement Conference to occur shortly before the Arbitration. It will proceed much the same as a Mediation. When liability, credibility, loss of income and medical requirements are produced and well documented by the plaintiffs lawyer – there is a good chance of achieving a fair settlement without going to trial. Though a negotiated settlement may be achieved at anytime in the litigation process it will most likely happen after the discovery stage and during Mediation or Pre-Trial. It may happen as late as part way through the Trial. Personal injury awards from the lawsuit are intended to compensate for losses and help the plaintiff recover. Personal injury awards from the accident benefits claim are intended to provide the injured person with the benefits that they are entitled to. There are many legalities and pitfalls in a personal injury case and is best to have legal guidance early in the process. You will not be charged for the initial consultation and no upfront fees are required for representation. A personal injury lawyer can be notified a few days following the accident or up to 2 years after the accident has taken place. People who miss the deadline for the statute of limitations, do not have recourse to make a claim.